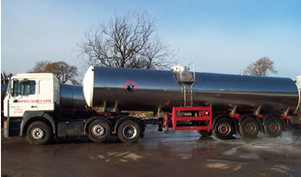 Bulk raw milk, bought from farms with NDFAS certificates, is delivered across the country in the Company's own tankers. This ensures that all the milk we sell has full traceability from farm to dairy and is delivered to the customer by required deadlines 24 hours a day. If you are interested in buying raw milk in bulk then please don't hesitate to contact us.